The global economy is returning to growth, albeit sluggishly, and there is a feeling that significant progress has been made in reducing the likelihood of another financial crisis (as explored in Box 1.4). This may reflect a false sense of control, as history shows that people do not always learn from past failures and are often taken by surprise by the same risks. Conversely, low interest rates have also fuelled the risk of asset bubbles. Since the financial crisis, the use of expansionary monetary policy – such as quantitative easing and zero interest rates – has not had the expected impact of significantly increasing credit availability in the real economy, instead leading to a reflation of asset prices. Credit booms and asset bubbles have historically resulted in bank bailouts and recession in the real economy (see Box 1.3). 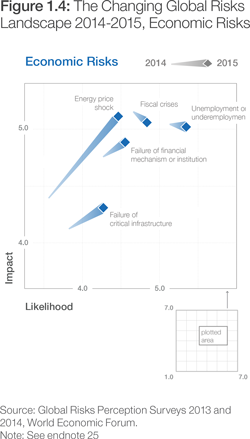 The risks of a failure of a major financial mechanism or institution and fiscal crises are perceived as equally impactful and likely as in last year’s report (Figure 1.4), yet other risks, such as water crises, interstate conflict and the failure of climate-change adaptation, have taken centre stage. This runs the risk of diverting decision-makers’ attention away from continuing economic reforms. Despite recent efforts (see Box 1.4), either deflationary pressures or the bursting of an asset-price bubble could still cause the failure of a major financial mechanism or institution – especially as the shadow banking sector is less regulated yet increasingly important.13 Likewise, in many countries public debt levels are still worryingly high so that the related risks are likely to persist over many years. Decision-makers’ focus on other risks could lead to inaction at a time when continued progress in structural reform is most necessary; The Global Competitiveness Report 2014-2015 outlines some priorities. 14 Maintaining the momentum of both financial and fiscal reforms will be crucial to avoid another major economic crisis. Box 1.3: Asset bubbles – a new old risk? The evidence of frothiness is increasing in a number of housing markets in both advanced and emerging economies – including Canada, the United Kingdom, Switzerland, France, Sweden, Norway, China, Hong Kong SAR and Singapore – as well as in a number of credit and equity markets across the world. The traditional goal of central banks has been economic stability: keeping inflation low while achieving robust growth. The current realization is that central banks must also seek to preserve financial stability – which means, among other things, avoiding risky bubbles. The current theory is that macro-prudential regulation and supervision of the financial system will avoid bubbles and achieve financial stability. However, bubbles are very hard to identify (price increases could also reflect market movements), and macro-prudential regulation has not historically been effective and excludes the unregulated shadow banking system. If macro-prudential regulation fails again, central banks will be left with only one tool – monetary policy – to pursue both goals of economic and financial stability. This may prove impossible. Trying to prick bubbles by using monetary policy risks causing a bond market rout and a hard landing for the real economy. However, keeping monetary policy loose in a bid to help the real economy risks inflating asset bubbles that will, inevitably, eventually burst and also damage the real economy. Loose monetary policy is the mother of all bubbles. Attempting to walk this tightrope will be a difficult issue for central banks in both advanced and emerging markets in the years to come. The global financial system is undergoing massive structural change as a result not only of the crisis but of the regulatory changes in its wake. The very fact that the whole post-crisis regulatory overhaul has been spearheaded by the Financial Stability Board and G20, i.e. with explicit political backing by a global set of policy-makers, is very innovative and has not been the case in setting international regulatory standards before. The past five years have witnessed a profound change of international regulatory standards for banks and non-banks alike. Banks’ regulatory rules have been revised (usually subsumed under the Basel III heading), resulting in stronger capital requirements, the first-ever globally agreed liquidity standards (for a short-term liquidity and a structural funding measure), and new standards for constraining large exposures and improving risk management. Also, supervisory standards are being raised and the international standard setter (Basel Committee) has launched a programme to assess national implementation, which exerts peer pressure on jurisdictions to implement the reforms in a consistent manner. Cross-border resolution difficulties witnessed in the crisis are reflected in the new set of expectations with regard to effective resolution regimes and a process of recovery and resolution planning for the largest banks, complete with setting up cross-border crisis management groups composed of authorities from the (most prominent) jurisdictions where these banks operate. Regarding non-banks, the international community is finalizing a basic solvency requirement for global insurers who are systemically important – to date there has been no global solvency standard; over-the-counter derivatives markets are undergoing major overhaul with measures aimed at mandating and/or incentivizing central clearing and trading on organized platforms with reporting to trade repositories of all contracts. In terms of insurance regulation, many countries in Europe, Latin America and Asia are adopting variants of the Solvency II regime. New insurance regulation has a strong emphasis on corporate governance, disclosure and accountability. These measures are relevant as they aim to change the broader corporate behaviour. International accounting standards are being changed, in particular to make loss recognition more forward-looking (newly issued IFRS9). Some supervisory authority over the financial sector has been relocated to central banks, most notably in Europe, where the European Central Bank has taken on additional responsibilities. Still, of course, challenges remain. Addressing the issue of “too-big-to-fail” remains a key issue. Efforts are needed to: (i) finalize living wills and identify and remove barriers to firms’ resolvability; (ii) reach consensus on banks’ loss-absorbing capacity to ensure that they can be resolved; (iii) address obstacles to cross-border cooperation and recognition of resolution measures; (iv) ensure recovery and resolution of non-banks; and (v) promote better regulation of the shadow banking sector. Cross-border challenges persist also in over-the-counter derivatives reform. As regulatory regimes developed in parallel in the two largest markets (European Union and United States), they resulted in a framework that overlaps and is not completely consistent. Regulatory decisions allowing reliance on home regulatory regimes (known as “deference”) are urgently needed. Trade reporting requirements have been adopted in key countries but legal barriers frustrate implementation. Progress on trading standardized contracts on exchanges and electronic trading platforms continues to slip. Political commitment is needed to advance reforms in all these areas. Source: This box draws on the latest Global Financial Stability Report and related IMF work. Note: In addition to the current regulatory reforms described above, some experts believe that profound changes in the corporate culture and incentive systems in the financial sector are needed to reduce excessive risk-taking. The world has more to lose than ever before from massive failure of critical infrastructure. To improve efficiency and lower cost, various systems have been allowed to become hyperdependent on one another. The failure of one weak link – whether from natural disaster, human error or terrorism – can create ripple effects across multiple systems and over wide geographical areas. Large-scale power outages might be the most visible illustration. The initiating event in the August 2003 power failures in the United States occurred in Ohio but the worst consequences were felt by 55 million people in the north-eastern part of the United States and Canada. The July 2012 India blackout was the largest in history, affecting 670 million people, about 10% of the world population, and was partially triggered by high demand during a heat wave. In many countries, infrastructure has not been maintained well enough to withstand the kinds of catastrophes that could spark such cascading effects. This is often the result of procrastination, the perception that the risk is so small that it is not worth considering or crowding out by other priorities, and the fact that investing in preparedness is rarely immediately rewarded in the electoral process. The challenge is financial, and incentives are misaligned. For example, in the United States, over 80% of infrastructure is owned or managed by private sector firms, which are not responsible for the negative externalities that failure of their part of the infrastructure could have elsewhere.1 To increase investment in infrastructure, a coordinated, global, long-term and multistakeholder approach is required. Upgrading infrastructure is essential, in recognition that resilient infrastructure has become the backbone of a competitive economy. 25. Global risks may not be strictly comparable across years, as the names and description of the risks were revised between 2014 and 2015. The risks introduced in 2015 are not displayed in the figures and only the risks for which the name or the description were slightly revised between 2014 and 2015 are presented. Water crises was categorized as an environmental risk in 2014 but as a societal risk in 2015. To ensure legibility, the names of the global risks are abbreviated. Please see Appendix A for the full name and description. 14 World Economic Forum, 2014. 1 Auerswald, Branscomb, LaPorte and Michel-Kerjan, 2006.